Just a few blocks to the beach! • 128 sq. m., 2 bath, 2 bdrm 3 story - $183,000 USD - Great Condo, Great Price! If you are looking for a great Condo in downtown Playa del Carmen, look no further! 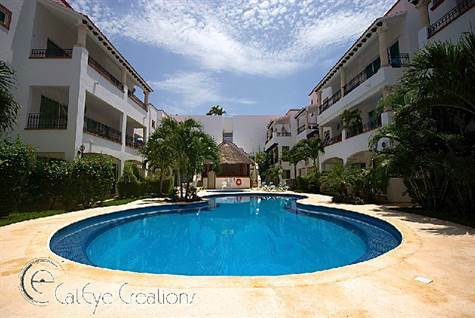 Now available in Las Gaviotas II is a ground level 2 bedroom and 2.5 bathroom Condominium. This condo is a fantastic vacation home with great rental history potential. Now is the time to invest in this property and enjoy your ROI opportunity. You will enjoy a very charming fully equipped kitchen, an open living floor plan decorated and furnished with a modern Caribbean approach. This unit comes fully furnished including sheets, towels and kitchen utensils. This condo has been updated with fresh paint, an automatic re-start dehumidifier, new countertops and faucets. The entire unit is air conditioned as well as having a ceiling fan in each room. This is an amazing turn-key opportunity. Las Gaviotas II has a beautifully landscaped pool area with Palapa for entertaining guests. The pool is well maintained and perfect for sunbathing and enjoying a cocktail. Las Gaviotas II is located just 4 blocks from the beautiful Caribbean beaches and turquoise waters of the ocean. You will find yourself close to major grocery stores, restaurants, shopping, cafés, night life and entertainment. For more information about this property, please contact us today.